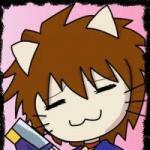 There are 9 posts in this thread, and it has been viewed 7358 times. 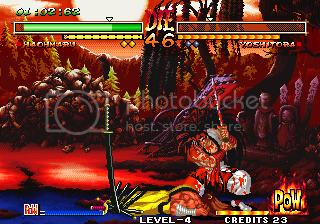 Samurai Shodown 5. What do you think of it? 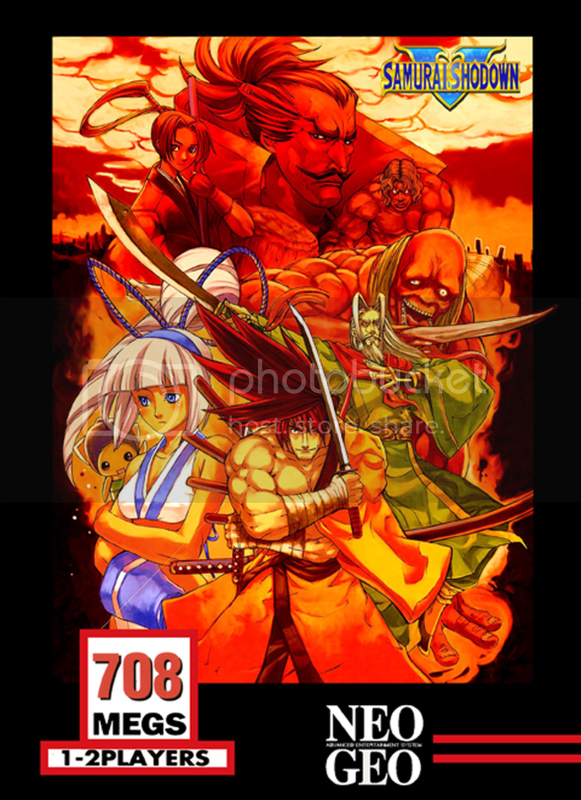 Being one of the most successful video game series by the original SNK team, it was just a matter of time until the successing company SNK Playmore would bring out a new Samurai Shodown game. So in 2003 SNKP hired an unknown company called Yuki Enterprise to develop the newest installment of one of the most influecing Samurai games out there. SNKP even managed to let a famous mangaka called Nobuhiro Watsuki (best known for the Rurouni Kenshin series) design some of the game's new characters. The result was Samurai Shodown V, in Japan known as Samurai Spirts Zero as the game's storyline takes place two years before Samurai Shodown 1. 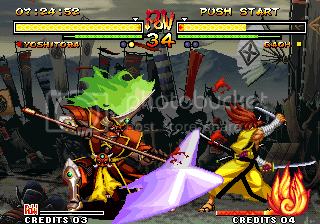 Being ported to modern consoles, Samurai Shodown V was quite a success although fans of the series remained faithful to Samurai Shodown IV, which still is considered as the series best installment. 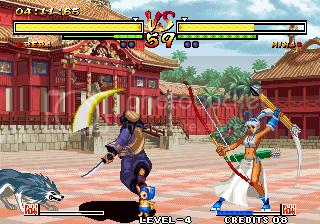 Samurai Shodown V, known as Samurai Spirits Zero in Japan, is the eighth game in SNK's Samurai Shodown/Samurai Spirits series of fighting games. It was one of the last ever games to be released on the Neo Geo. The original Japanese version of the game also has a great deal of dialogue in single-player mode, but all of those scenes are simply left out when the game's language is set to English. Upon request. As long as there's interest for conducting a High Score Challenge, we'll arrange one. Priest would be happy to hand out some medals to some worthy challengers! Um, are we including SamSho V Special, cause one of the screenshots is from SSVS, if not, possibly in another review, since its basically the same game, with minor updates, and the bosses playable. But yes, SSVS did manage to make it a bit better, but I guess that'll be for another GotW, unless not including it in this one. I enjoyed it, but I prefer II and III... oh and I of course is a classic! I like it although it does at times feel like a diluted version of 4. If it had the control system of 3/4 then it would be a better game and its a shame it cant be changed ( without modding). Still I really like it but 4 is the boy. I'd have bought the AES version of the regular SamShoV long ago if it only had some crucial features from SamShoV Special. What made 'Special' so awesome were for example the controversial Zetsumei Ougi or the classic Boss characters like Mizuki. 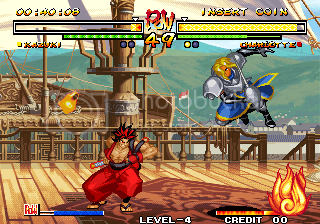 The regular Samurai Shodown V might have some really pretty background stages (the ship) and more or less a storyline in Singleplayer mode, but otherwise it is nothing groundbreaking. No wonder you can find the Japanese AES version for quite a reasonable price. Although a big fan of the series I'm not keen on 5 and 5 Special. The control scheme in 3 and 4 was perfect and it was a mistake going back to having to press two buttons for a heavy slash. Some of the new characters are very poor designs IMO especially the girl with the bow and her 'pet' and also that monster. They seem really out of place. It was cool how you could pick a slash or bust version of every character in SS3 & SS4 and it's a shame they got rid of that. Also SS5 & SS5S overall don't look quite as nice graphically as the two previous games. I don't feel that much desire to play them. I'd say SS3 & SS4 are the best games in the series and amongst the best fighters on the system. Unfortunately way too expensive for the game that it is (not that it's bad). I'll pick it up one day, though it's low on my priority list and I'd like to get an "unfixed" copy of SSV Special first... IF the day ever comes that I have over $1K in my pocket with nothing more urgent to do with it.